On the weekend of March 31st, April 1st and 2nd, the ACS Drama Club pulled off a tour de force. 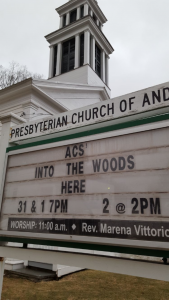 When partway through rehearsals of Into the Woods, a quirky new look at the “happily-ever-after” of familiar fairy tales, with a challenging Stephen Sondheim score, they had to vacate the school gym/auditorium for repairs and move across the street to the sanctuary of the Presbyterian Church. Somehow the directors, Elaine Peck, John Bernhardt, Lisa Valkavich and Jonathan Andrews, re-blocked the entire musical. They cleverly used the curtained choir loft as the interior of the castle as well as the hut where Grandmother and Red Riding Hood were swallowed by the subtle, dangerous wolf (played by James De Pierro who doubled as the Mysterious Man.) 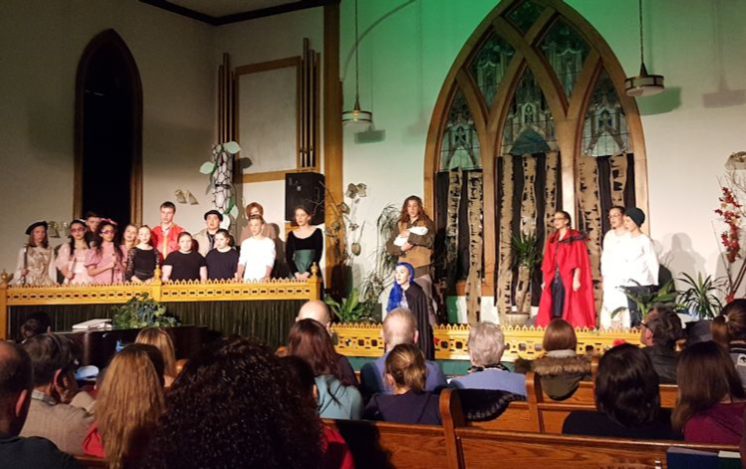 The cast was led by stalwarts of previous productions, high school seniors making their last appearance here: Noah Dougherty and Monty Damone (the doughty Baker and his ever-hopeful wife), Serena Bacon (scintillating Cinderella) and, as a wickedly scary witch, Winnie Richards. They made the space their own. The rest of the actors filled in superbly, set in motion by a strong new voice, that of Mathias Mojallali, the narrator. The whole musical was a wonder for which the congregation was happy to retreat to the chapel. 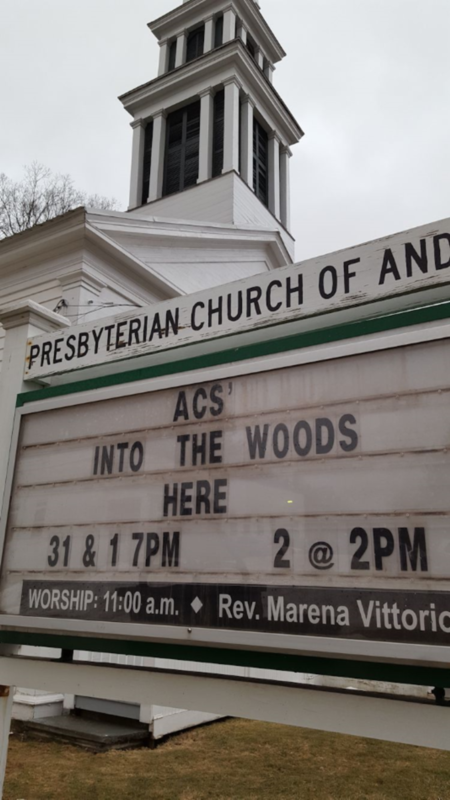 It should be noted with appreciation that the birches, props, costumes and the last trace of grease paint had disappeared entirely in time for the funeral of ACS Board President John Hopkins on Tuesday, April 4th. And the school let out early so everyone could come.